Bring the melodies of house wrens into your garden with the Coveside House Wren Bird House. These active birds offer their songs throughout the day, and stay busy creating several nests. At mating time, the female decides the nest she likes best and roosts there. This home offers the perfect shelter for these small birds. The slanted roof has a significant overhang to protect the interior of the house from precipitation, while ventilation slots on either side of the roof keep the interior temperature regulated. Angled corners at the base of the home offer drainage to the nest, keeping it dry, and the deep form prevents predators from reaching the eggs. The rough hewn pine allows nestlings a secure grip when they are trying to exit the nest. One side panel lifts upward for easy cleaning and nest checks, and a small metal latch in the corner keeps it securely closed. The 0.75" thick wood aids in insulating the home, while the light color of the unfinished pine helps keep it cool in the summer. This pine will age to a graceful gray color over time and with exposure to the elements, enhancing its natural beauty. A metal hanger at the top of the item and predrilled hole near the base allow it to be post or tree mounted with ease. 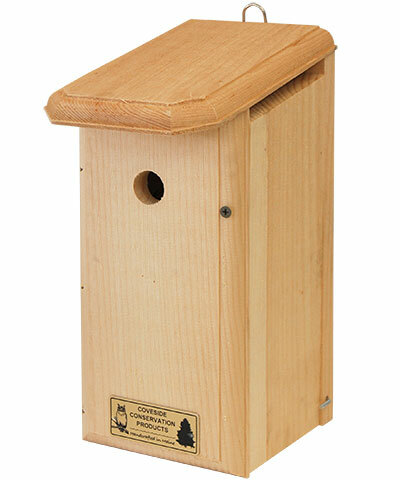 Offer a comfortable roost to house wrens with this House Wren Bird House. Made in the USA.